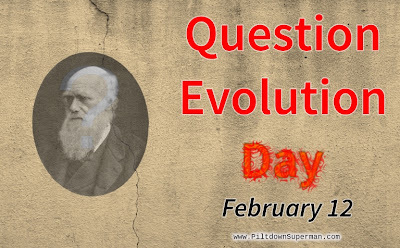 For Question Evolution Day, the link between evolution and the inerrancy of Scripture is explored. People who know their Bible and have a good understanding of doctrine know that evolution and creation are irreconcilable. Theistic evolution, the "Gap Theory", "Progressive Creation" and other compromises require eisegesis (reading into the Scriptures). People who do this elevate man's "wisdom" above that of God's revelation. That is ridiculous (1 Cor. 1.20, Psalm 14.1-3). Why would anyone want to add philosophies and interpretations of evidence that are based on atheism? And yet, the inerrancy of Scripture is of paramount importance to a proper understanding of the Bible. What is your ultimate standard? Is it God's Word, or the ever-changing whims of man-made science philosophies? For the purposes of this article, only inerrancy of Scripture of the five fundamentals will be discussed. The attacks on inerrancy, beginning in Genesis 1, brought doubt to the Creation account, which led to doubt on Biblical inspiration, doctrine and authority of not only Scripture but of God Himself. After the publication of Darwin’s Origin of Species, many theologians came to accepting evolution as truth. This thinking came into once very conservative seminaries as evolutionist thinking and more liberal seminary professors inched their way into these halls of theological training. Needless to say, a war broke out between the fundamentalists and the liberals. This led to the famous sermon by Harry Emerson Fosdick in 1922 titled “Shall The Fundamentalists Win?” Then, after the Scopes Trial of 1925, where Clarence Darrow made William Jennings Bryan, one of the stars of fundamentalism in his day, look like a complete idiot, the fundamentalist were defeated, but not down completely. After the fundamentalist resurgence in the late 1970s, liberals were driven out of denominations such as the Southern Baptist Convention. One of the casualties was one Dr. C. Welton Gaddy. Gaddy. Gaddy’s reaction, according to an article in the Charleston City Paper (no year is given as to when the article was written, only the date of April 14) “What happened that day in 1981 was part of the fundamentalist takeover of the SBC as they led the nation’s largest Protestant denomination to secede from mainstream American Christianity. Through the 1970s and ’80s, fundamentalists conducted an almost Stalinesque purge of moderates from positions of authority in the convention, its churches and seminaries.” Obviously, Gaddy was not a happy camper. I urge you to read the rest of this informative and extremely interesting article in its context, "How Evolution Undermines Inerrancy".